Hugs & Kisses and Greetings from Tehran! Hi everyone! I made it! I’m in Tehran! Can you believe it? I still have a hard time believing it. I am digging the snow-laden mountains and the amazing food and getting spoiled rotten by a dear friend. There’s no way I can express or detail the events, feelings, impressions, and my thoughts right now – I wish I could – but I’ve taken loads of pix and videos, and until I return to NY and have time to decompress and reflect, I’ll the photographs do (most of) the talking. This first photo is one that I took of 3 cute and vivacious young girls who were only too happy to oblige my request to take their photograph. One of them said: "Oh! Let me first take off my ugly thick socks" and promptly did so and then the three of them posed with the skill and ease of Hollywood stars on the red carpet. Turned out they are architecture students. I loved their energy, enthusiasm and zest. Meeting them really cheered me up. 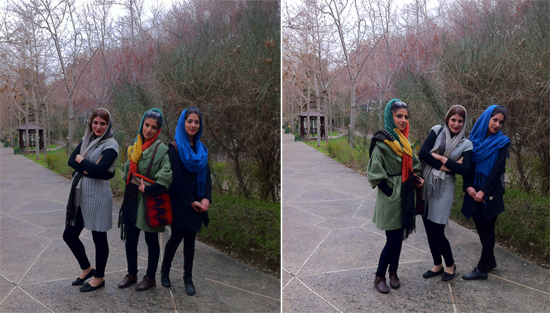 I encountered them in park ‘eh saee (Saee Park) – a most beautiful and elegant park founded in 1950 as a forest reserve by the late Dr. Sa’ee – an engineer and professor at Tehran University. This is a statute of Dr. Saee and if you look closely you’ll see he’s holding what appears to be a budding flower bulb in his hand. Within the park ‘eh saee there are waterfalls, brooks and ponds – and there are secluded benched lanes lined with cypress and magnolia and cedar trees. It is a romantic park and as such seems to be a romantic destination. I passed through on a cold drizzly day, even so, several benches were occupied with courting couples. I wanted to ask to photograph them, but felt weary of interrupting their tete a tete. 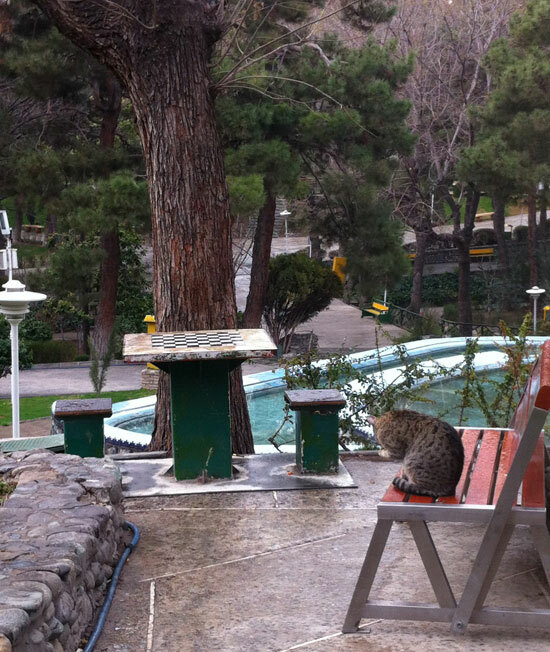 The park is also frequented by many many pishi cats! Lots of them lounging or foraging, fanning out their claws to show off their prowess and lack of interest in being a photography subject, or else licking their paws as is their feline way. Speaking of parks, there are so very many of them! Lots and lots and lots! Many existed in my time but quite a lot of new public parks have been added since. 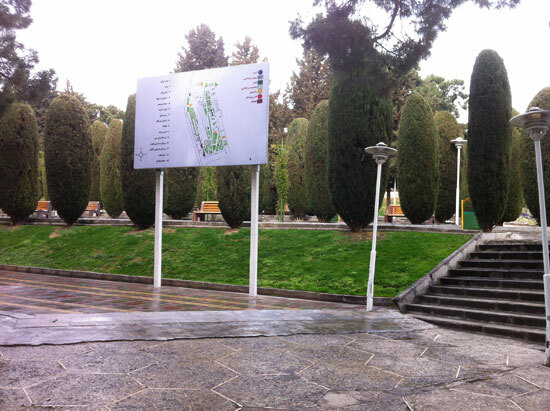 I should add that back when I lived in Iran, we called these public spaces "parks" but now, the official lingo is reverted back to the Persian word of "boostan" which signifies the same thing. Almost every park has a line of yellow & red colored exercise machines. Men, women and children are encouraged to use them. In some parks, women can use any of them but in some other parks I saw notices that exercising on one side was reserved for men and on another side was for women. I hope you are digging this photo I surreptitiously took of an elderly woman swinging on one of these machines as much as I did. This particular park is one a stone’s throw away from my friend’s house. Do you see the mountains? Here’s another view of the mountains – taken near my friend’s office. 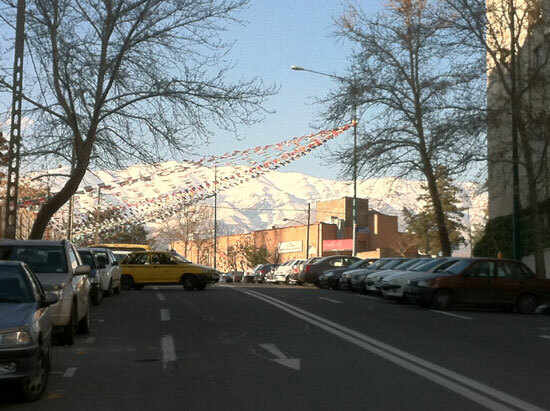 Tehran’s blessing is that it is lined by the gorgeous Alborz mountains. Tehran’s curse is that these same majestic mountains act as a natural and mighty barrier keeping the air and thus the pollution locked in. All the forestry, parks and trees thus do double duty as not just providing public hangouts but also a step in countering the problem of pollution. Everyone tells me I’m lucky I’m here at this particular time of year because just before I arrived and soon to come, the pollution was and will be so severe as to entirely obscure the view of mountains. I was making my way from a street lined with bookstores back uphill to my friend’s place of work when I encountered this dinosaur! It is a slide – part of a children’s playground. A very small but tidy park with benches and this fountain was adjacent to the playground. 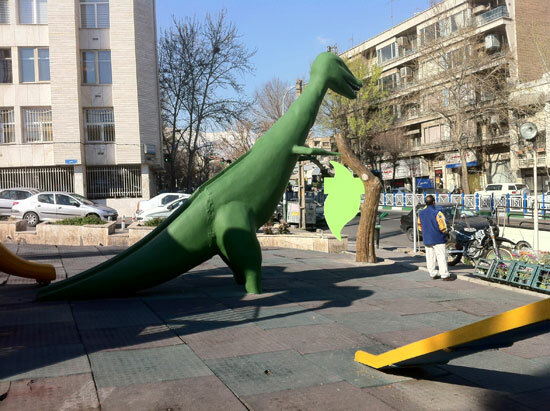 I really enjoyed encountering the dinosaur and this park. So random! 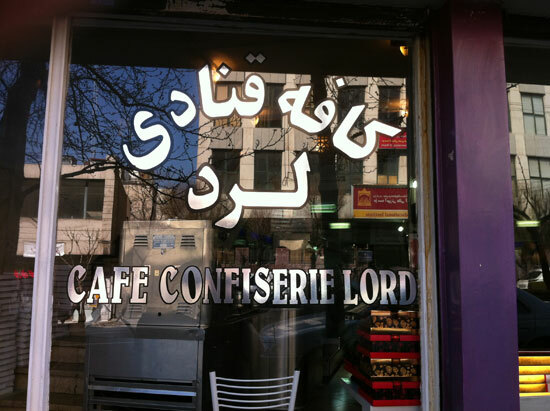 Speaking of random — here’s a photo of Cafe Lord located at khiyaban e’ Villa (Villa street) where I had coffee with a wonderful UK-based friend who by pure and awesome luck was also in Tehran at the same time. 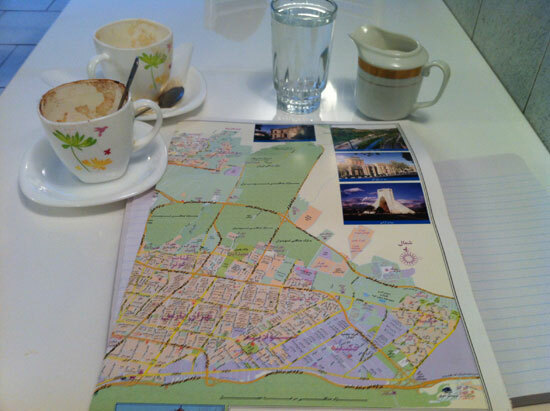 After she left, I spend some time poring over the map of Tehran. 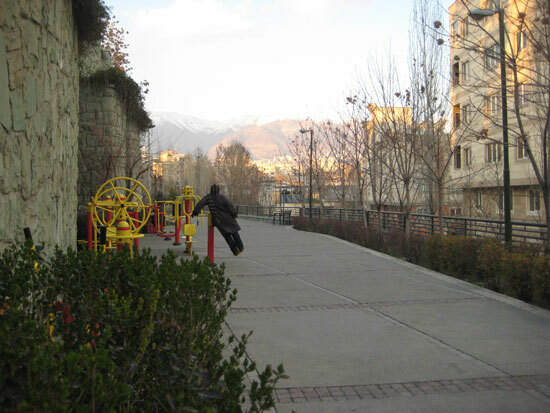 Tehran is vast and much bigger (by leaps and bounds) since I lived here – intersected by numerous highways and sprinkled with many new neighborhoods. I’m beginning, however, to slowly begin to make sense of it. 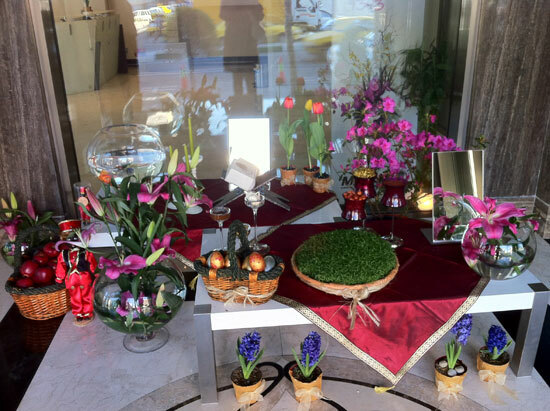 Now, tomorrow at approximately 8 pm local time is when winter packs up and leaves and spring begins and that exact moment – called sal’eh tahveel – marks the beginning of the two week Persian New Year festival of Norooz. 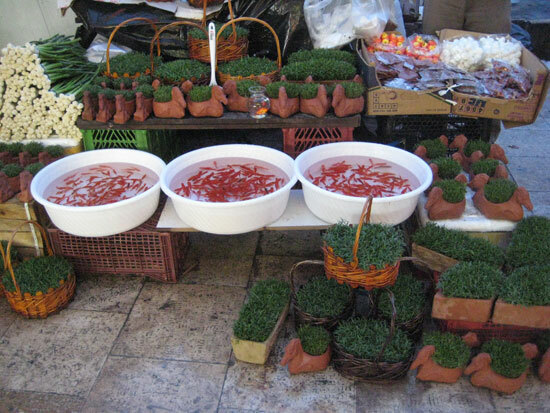 So let’s conclude this totally random debut post from Tehran with some Norooz related pix. 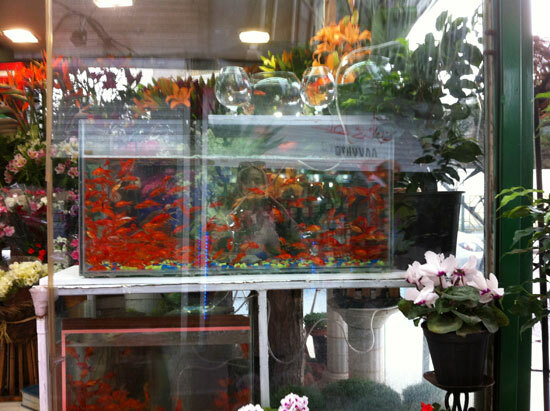 And let’s end with just one of the many haft seens one sees in the storefront windows, shops or in this case, the lobby of a shi shi building in Tehran. So! I hope to figure out the Internet connection (ahem) and my way around Tehran soon. I also hope to shake off the remnants of jet lag and start posting missives from Tehran in earnest and with more frequency. 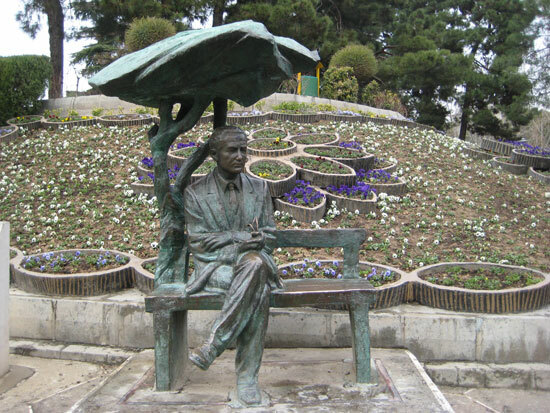 Meanwhile, hope you enjoyed this tour of Tehran and happy spring everyone! And dear irooniha: Norooz ‘etoon Pirooz! How wonderful and beautiful it is in Tehran, you are going to have a lovely time and I can’t wait for more posts and pics. Those young girls are beautiful and so animated. The parks are gorgeous! Azita na m I am so happy to see you are enjoying your time in Tehran. Tell us everything from the moment you arrived… with pictures. Norooze to ham pirooz! So amazing to see that it’s a real place after imagining it through your blog! Wow. It’s so beautiful! Thanks so much for sharing your excitement! Keep the updates coming! No Rooz Moborak to you and your doost-e aziz. Thrive! Dear Fae, I’m FINALLY getting back to replying to some of the comments that I couldn’t answer when I was traveling. Wow, how fascinating, that was your neighborhood? I felt incredibly nostalgic walking in the park and I can only imagine the memories (hopefully mostly good) it would have brought back for you. It was a very nice part of Tehran. I loved spending time around there. Lovely pictures and stories. Thanks for them. Lucky for you about the clear view of the mountains, massive. I haven’t been back since we left in ’77 and so badly want to go. Thanks for all the pics and catching us up. 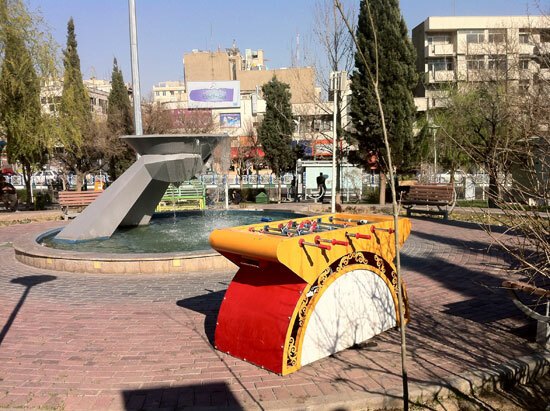 It’s so nice to see what Tehran’s like now and what a wonderful time for you to be there. Happy Nowruz!! Dear Coco, I’m FINALLY replying to a few comments from way back this time b/c couldn’t when I was traveling, anyway, just wanted to say that I know the feeling when you say you badly want to go and so I hope with all my heart that you will get to go. Crossing fingers that this will come true for you. It was a wonderful and poignant (even if bittersweet) trip for me and I would love for you to experience it as well. Had no idea how beautiful Tehran is Azita! It’s lovely you are taking the time to post and share with us. So interesting! Dear Seana, first long time no hear and now I’m lucky enough to cross paths w/you a few times in one day, this time via an old-timey comment you left that I only now can reply to. I’m very punctual like that. But had to pipe in even belatedly to a) thank you for reading and commenting and b) to say that I haven’t begun to share the really pretty parts of Tehran. It really is a beautiful city. I’m partial of course but it is true, regardless of my bias. This post made me so nostalgic! Have a great stay! Happy Norooz and I want for you a wonderful year full of love, happiness and success 🙂 I just found your blog and I find it so interesting! Have a Good time in Tehran! I’m so happy to read you’re enjoying your time in Tehran! It is indeed a great city, for sure. A lot of the places you’ve shown or mentioned are bringing many good memories back up… Thank you for taking us there with you through your words and camera lens. Dear Josiane, I couldn’t reply to comments when traveling but have to make a very belated reply to say that I’m honest to goodness thrilled that these pix brought back good memories for you. I really wanted to SHARE this experience because I know firsthand how one pines for glimpses and images of places one has been away from. i really hope that you can enjoy your vacant ion as much as you can, after more than 30 years you deserve it! Azita jan, beautiful post! Fab photos. To all those who have stayed away from Tehran far too long, hope you all take inspiration from Azita’s wonderful depiction of a memorable trip. Wish we could have spent more time rediscovering Tehran but even the brief dashing around town was great all the same. Thank you for sharing your treasured time with us. oh how great, I only just saw this now, love the lady on the swing, great pictures, like taking a walk down the street with you! Enjoy it! That’s a beautiful park! Tehran IS beautiful! Love the pictures of the girls. Hi guys! Our encounter will always be one of my favorite memories of my trip to Iran! Email me so that I’ll have your email contact. Would love to get back in touch.